For both you who were wondering, the blog header is a close-up of a photo taken of the Aztec test done on Christmas Island in 1962 as part of Operation Dominic. A bit heckish in it’s look I think. I happen to have a bit of an interest in the old American nuclear test program. I’d love to take a tour of the Nevada Test Site, where you can see giant craters and the eerie remains of nuked suburban houses. The Trinity site can be visited too, but it’s only open twice a year. Though Isuppose you don’t have to visit get your hands on some Trinite. 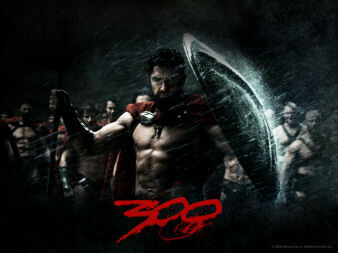 300: manly-men in tight leather briefs take their long, hard spears and thrust them deep into the bodies of their enemies. (Note that the stake through the heart tradition doesn’t so much kill the vampire as stop it from leaving the grave. It’s ahrd to get up if there’s a spike going through your chest and into the ground behind you). Use of the word “scrotum” in the Newberry winning children’s book “The Higher Power of Lucky” has caused some librarians to ban it from elementary school libraries. In further testicle-banning news, a Maryland legislator has called for the outlawing of “truck nuts”. I saw the stangest thingyesterday. Next to the bus stop where I wait for my connection is a garbage can, and next to that is a can for recyclables. While I was waiting for the bus a homeless guy comes along and goes through the garbage. He comes up with an aluminium soda can. He then put the can in the recycling bin and walked off.